Book signing: Oompah! Jazz Up Your Scrap Quilts With the Accordion Sewn HSTs™ Method. Renowned quilt designer Beth Helfter of EvaPaige Quilt Designs will be at Knit One Quilt Too on December 8 from 10:30 to 12:30 to sign her book, Oompah! 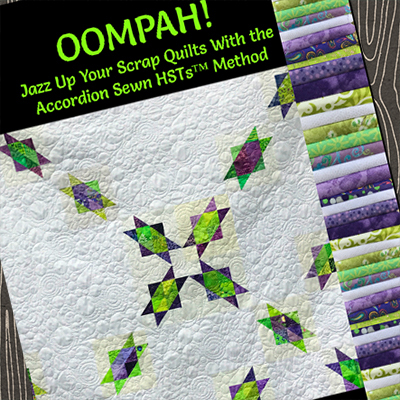 Jazz Up Your Scrap Quilts With the Accordion Sewn HSTs™ Method. Half square triangles are a staple in quilt design, but in designing scrap quilts, Beth craved more free-form and less symmetry. In the book, she includes step-by-step directions for creating Accordion Sewn HSTs, her unique method that you can learn. There are so many wonderful combinations of colors and her method is brilliant. Beth will have books on hand to purchase.